Enjoy a beautiful rock climbing day through Switzerland in the heart of the Alps. This tour is available from May to the end of September. The full-day climb starts at 9:00 a.m.
Half-day tours start at either 8:30 or 9:00 a.m. depending on the month and the weather. The tour is public. Private tours are available starting with a minimum of 4 people. The climbs are led by qualified IVBV, UIAA, SBV mountain guides. What to bring? Energy bars, picnic lunch (for full-day climbers), water, sunscreen, sunglasses, and a camera. Transportation is possible from Interlaken hotels and the Interlaken Ost and West train stations. After the activity, you will be dropped off where you were picked up. If these locations are not relevant to you, meet at the climbing school at Hauptstrasse 34, 3800 Matten bei Interlaken, Switzerland. If you need to arrange a meeting point, please let us know. Your accommodation, Interlaken Ost and West train stations, or the address below. Switzerland's position in the heart of the Alps draws visitors from all over the world looking for spectacular outdoor activities. 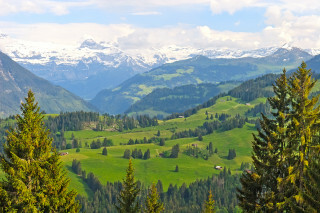 Spend a half or full day rock climbing in the Swiss nature to reach gorgeous views of snow-topped peaks and green valleys. If you're a beginner, the massive Alps offer more friendly routes where your certified guide teaches you techniques and tricks. If you’d like to challenge yourself, the routes are chosen on your level and the skills you want to improve on. Just let us know what your goals are and we'll find the best place to help you reach them. You can choose half-day climbing or full-day climbing. From your accommodation in Interlaken, your guide picks you up to transport you to the climbing location. From all the technical gear to a small backpack for your personal items, you’re set for the ascent. The specific route is decided close to the activity date based on weather and rock conditions. If you'd like to climb for the full day, the area with these routes has a BBQ. You are welcome to bring your sausages and the guide will fire up the grill. The rock faces in the Swiss Alps provide true adventure and stunning views. With such unbelievable surroundings, they no doubt leave you breathless, and a bit like you walked into a postcard. 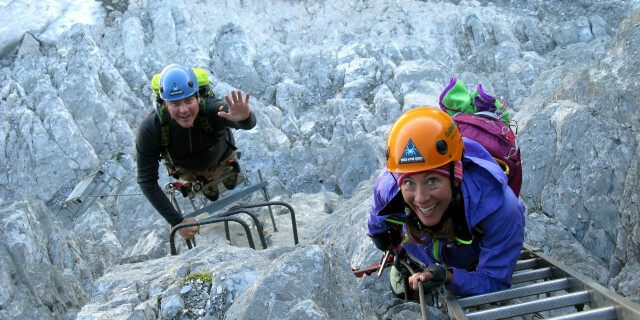 Climb a via ferrata along the monstrous Eiger North Face, one of the world’s most famous peaks. 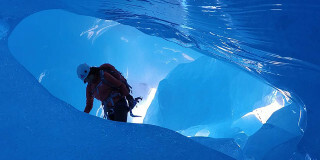 Abseil into a glacier's crevice to experience the "coolest" climbing adventure in the Swiss Alps.